For 2011, The RANGER RZR family receives aggressive front-end styling that increases cooling airflow area by 29 percent, new side protection for easier ingress and egress, a new in-cab accessible glove box, High/Low headlights for increased night visibility, and a new fuel management system coupled with a new tank that offers 30 percent improvement in range with better slow speed drive-ability. Quality improvements include better clutch/belt cooling, improved front and rear drive durability and sealed dash switches. The units also will feature new easier-to-use side nets. 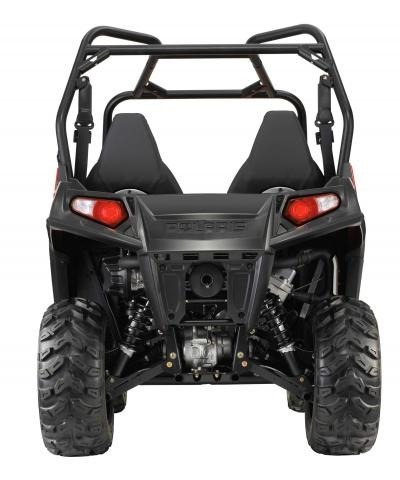 The RANGER RZR 800 will offer more razor sharp trail performance with six percent more power in 2011 with the addition of an 800 H.O. 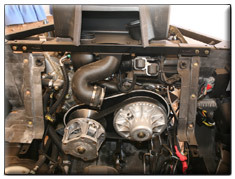 engine giving the RANGER RZR 800 55hp and quicker acceleration corner-to-corner. 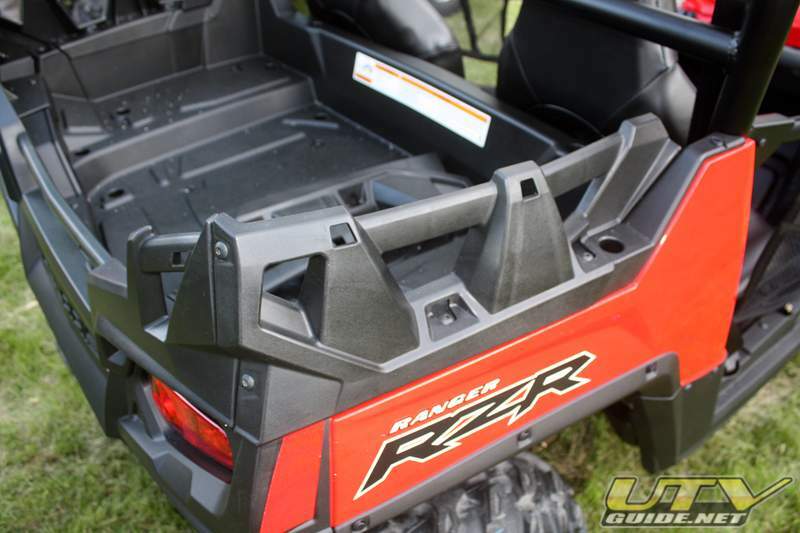 Built for the trail, the RANGER RZR 800 also will include new trail-friendly rear rack extenders to make it easier and more convenient to carry more gear. 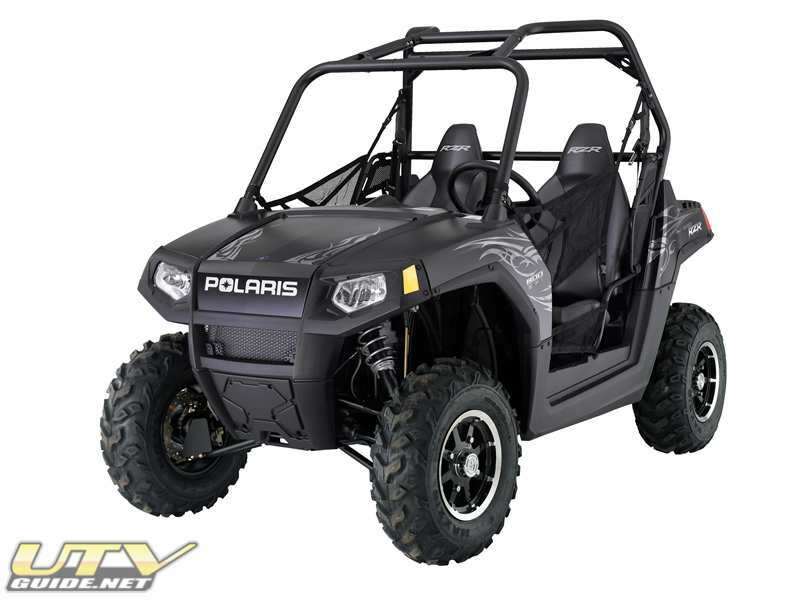 For hunters, Polaris also will offer the vehicle in the new Polaris Pursuit Camouflage pattern. Air Intake Fix - Looks like the throttle body now has a lip to help keep the boot on. The boot that connects the filter housing to the throttle body has a few bellows that help with flex, and the filter is much larger. More details. It has been rumored for months as the Ranger's "Evil Twin", but now it is the real deal. 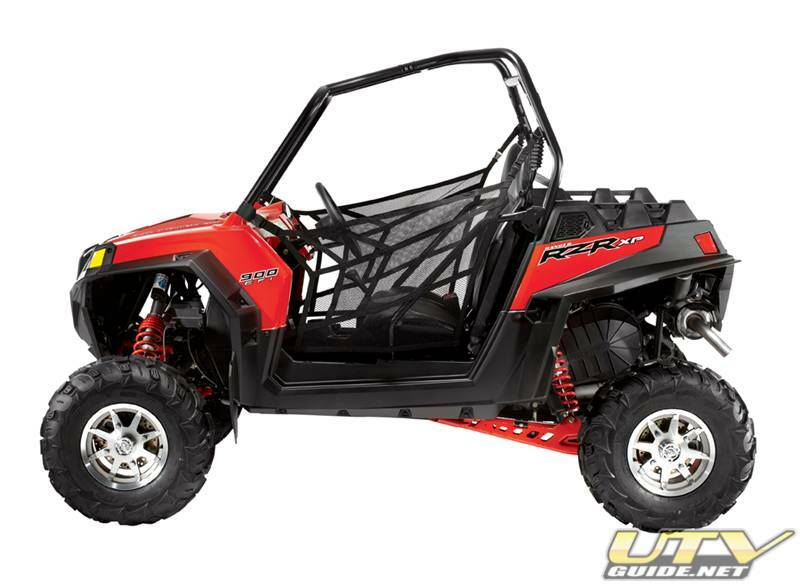 The RZR stands for "Razor".... As in Razor sharp side-by-side. 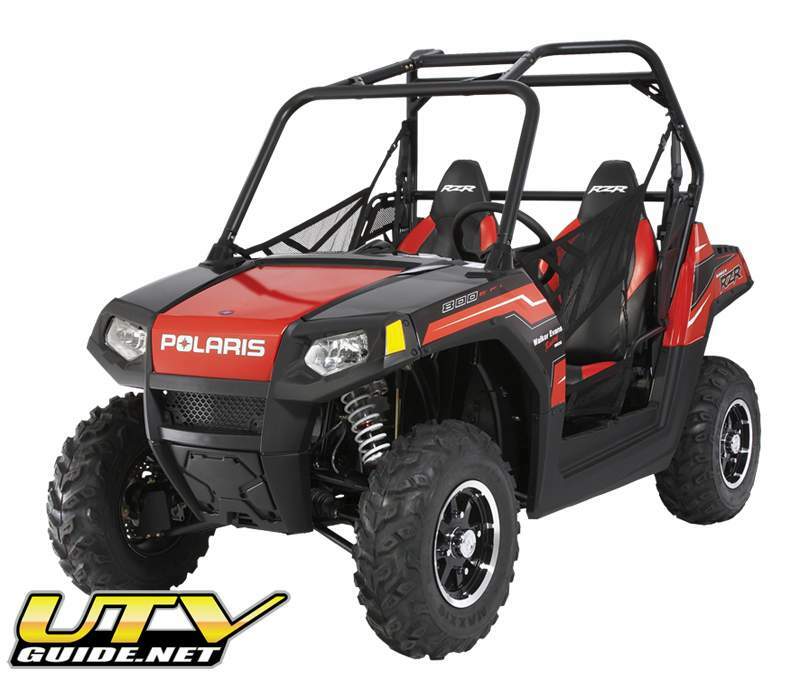 The all new Polaris Ranger RZR. It is smaller, lighter, and faster than any side-by-side currently on the market. 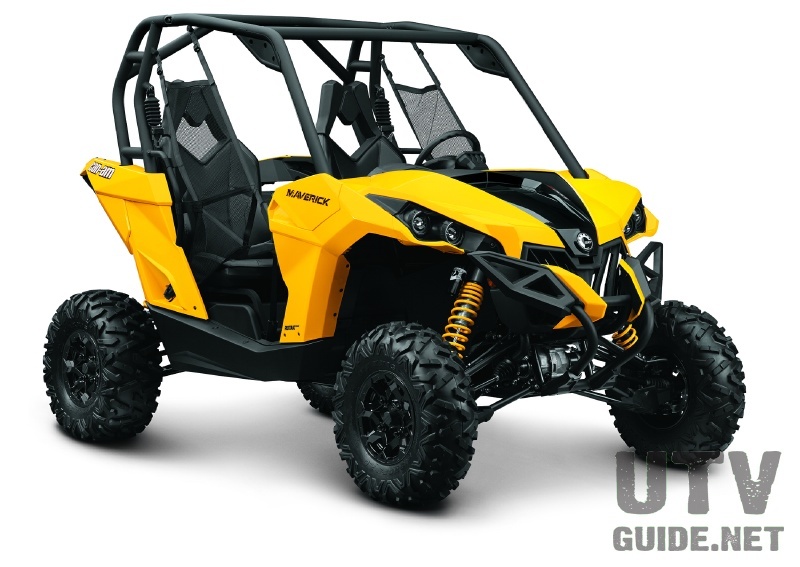 It is incredibly responsive with lots of power provided by a twin cylinder 800 EFI engine, low center of gravity and front/rear anti-sway bars. 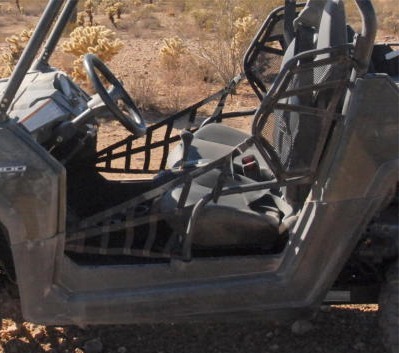 Looking at the RZR head-on, it looks very tippy, but from the side you can see the lowered seat placement and a longer wheelbase which will help keep it on four wheels. 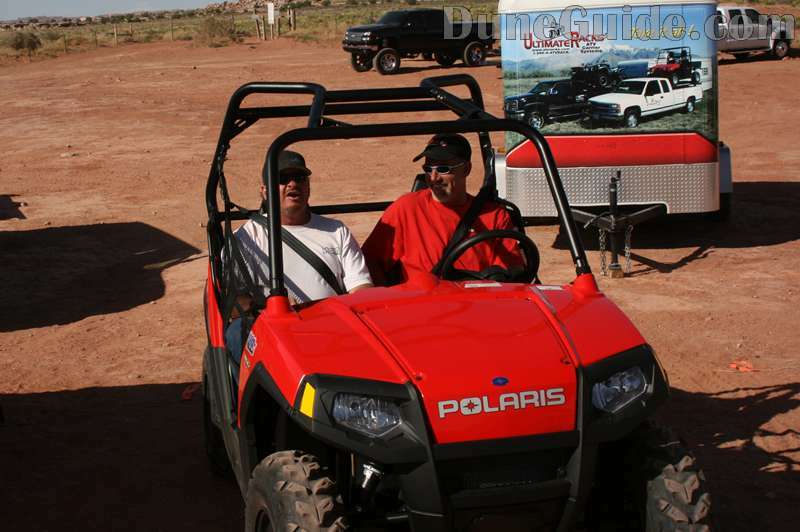 KMS Performance was kind enough to let us take their brand new Polaris RZR out for a test drive while at the UTV Rally in Moab, UT. The power was smooth and would spin the back tires on loose soil. The throttle was a bit twitchy. A heavier throttle spring may help there. 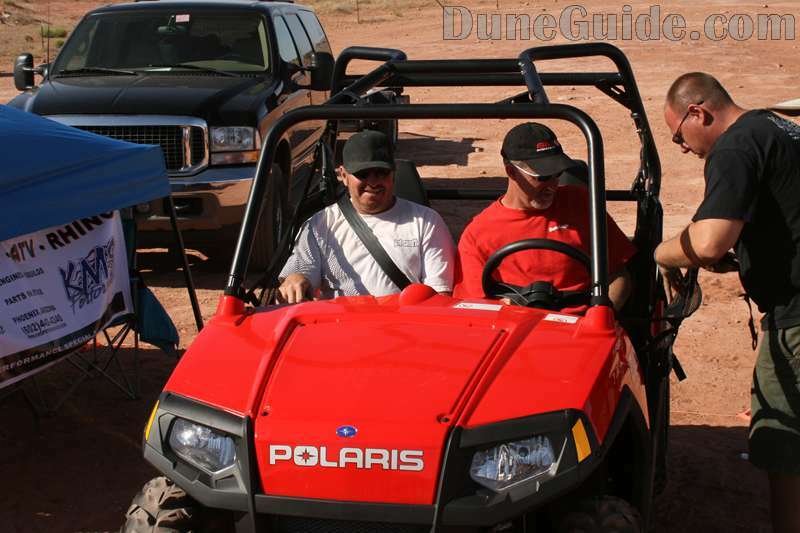 The RZR did not feel narrow or small with two of us in it. Climbed up some decent rock areas with ease. And it accelerated up to top speed real quick. 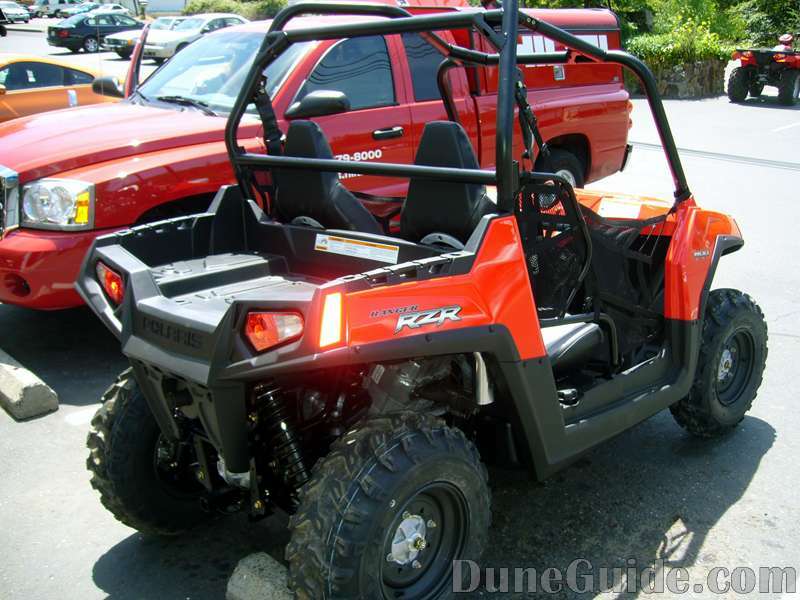 The RZR is powered by an 760cc EFI even-firing, twin cylinder engine that is mounted sideways behind the seats. 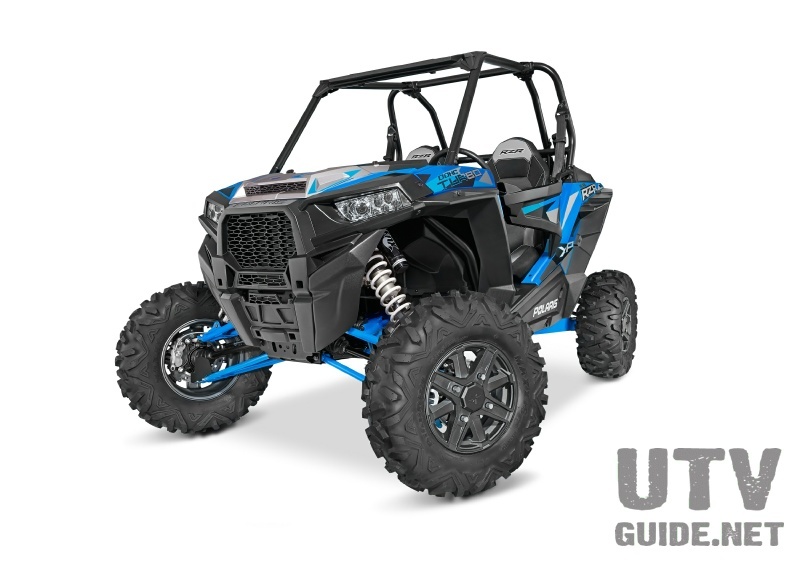 The electronic fuel injection system constantly and automatically compensates for changes in altitude, pressure and temperature, making the RZR extremely reliable no matter where the rider chooses to go. 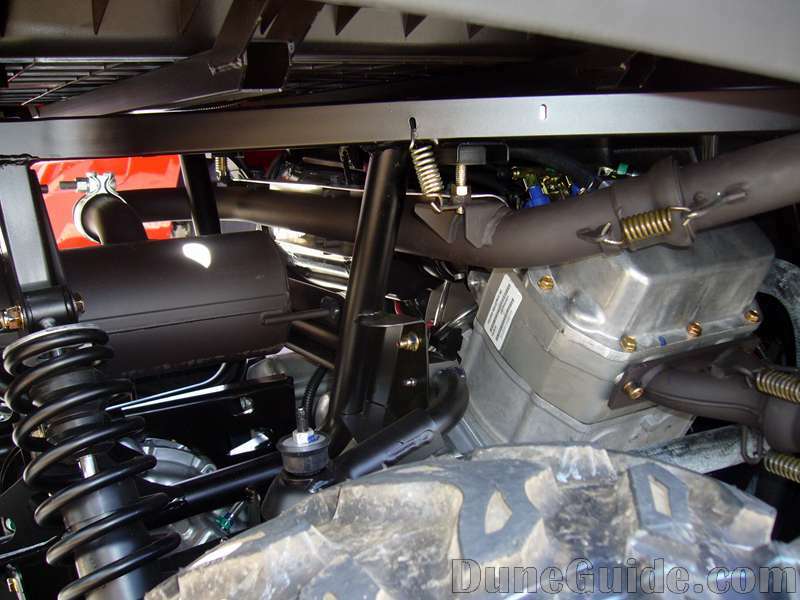 In addition, the need for re-jetting after upgrades like high flow intake and exhaust systems should be eliminated (may need a EFI fuel controller to take full advantage). There are some reports that this engine puts out 40+ horsepower! The good news is the 760cc EFI engine is not new to Polaris (also used in the Polaris Sportsman 800 EFI) so reliability in early models should be better. Power delivery is a bit twitchy. 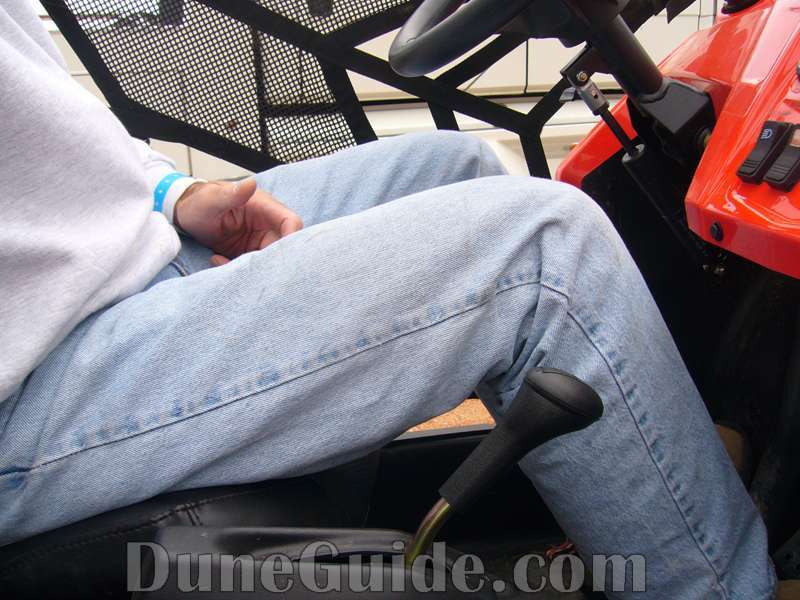 Since the RZR is fuel injected, the throttle isn't really moving anything in a carburetor like the Rhino. A stiffer feel to the pedal would be nice. 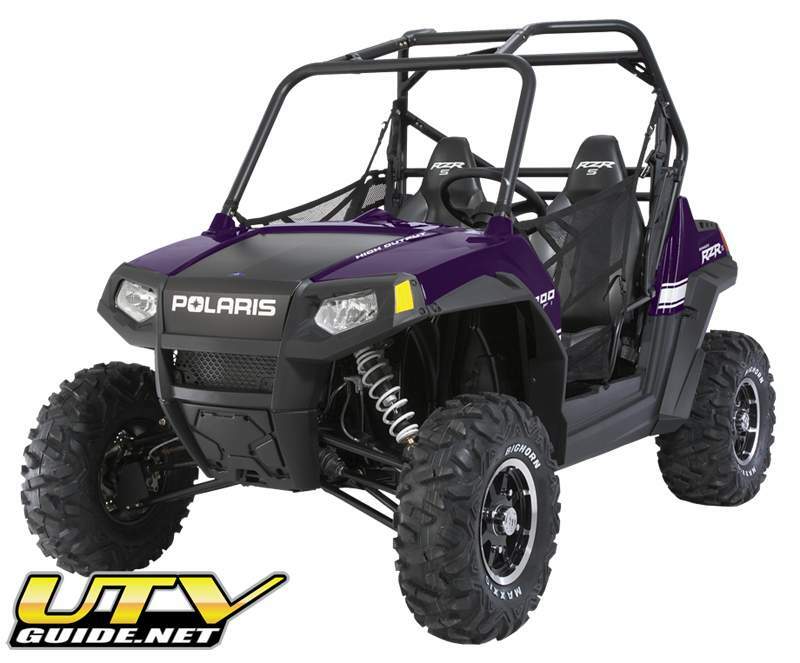 The dry weight of the Polaris RZR is 100 lbs. less than the Rhino. 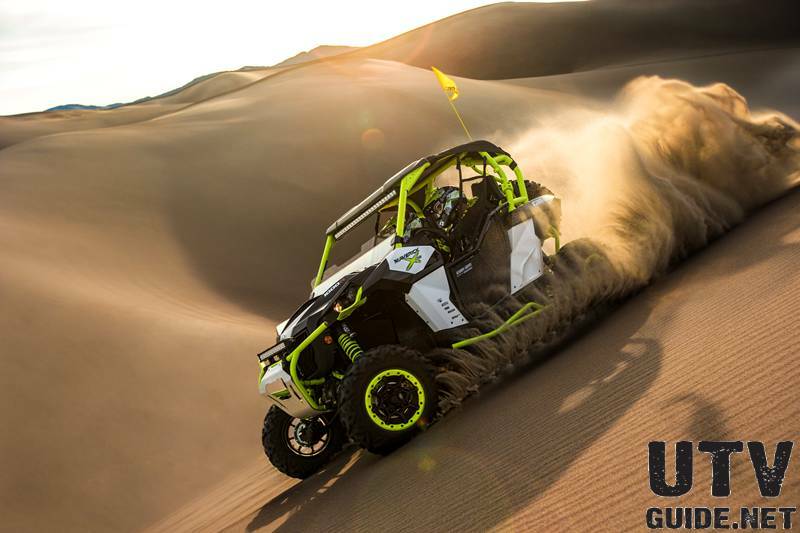 With a larger engine (800cc delivers 30% more horsepower than the Rhino) and EFI, the RZR's power-to-weight ratio is reportedly 44% better than a Rhino. It also reaches 35 mph 26% faster than a Yamaha Rhino. 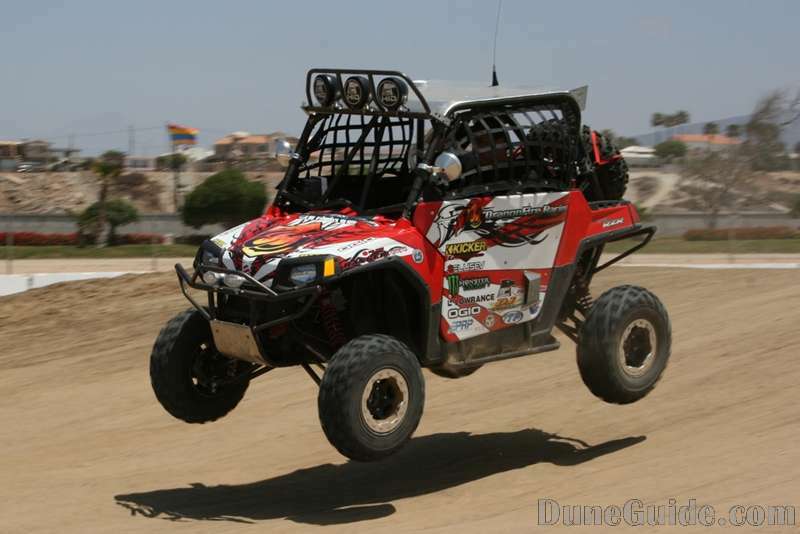 The RZR also has the highest top speed of any currently available side-by-side. A stock RZR can make it to the top of Sand Mountain, NV. Stock Rhinos can make it about one-half way up the hill. Big difference in power. 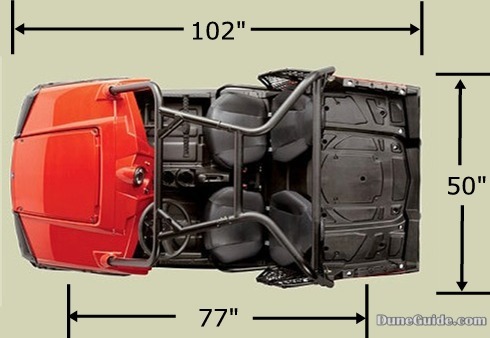 At 102" long, it is almost a foot shorter than the Yamaha Rhino (113.6”). Not enough room for people to turn it into a four seat UTV. 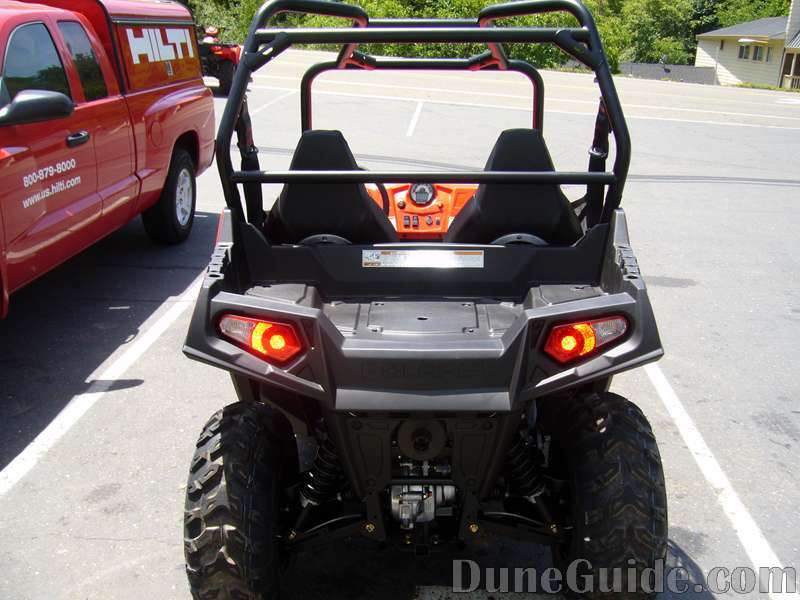 At 50" wide, the RZR is narrow enough to be used on most ATV trails. 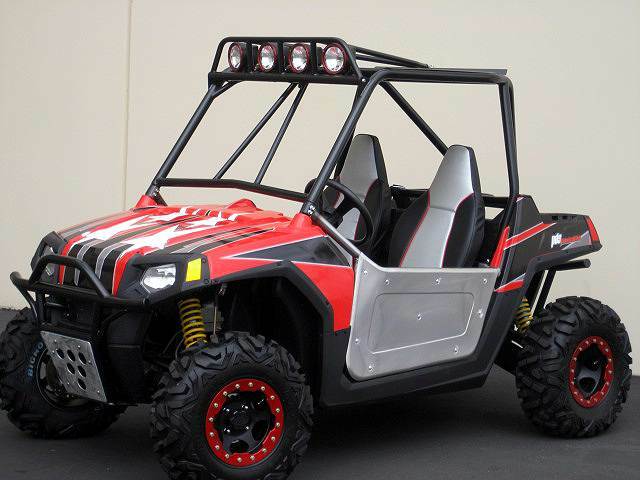 Although the RZR is shorter, it actually has a longer wheelbase by almost two inches. 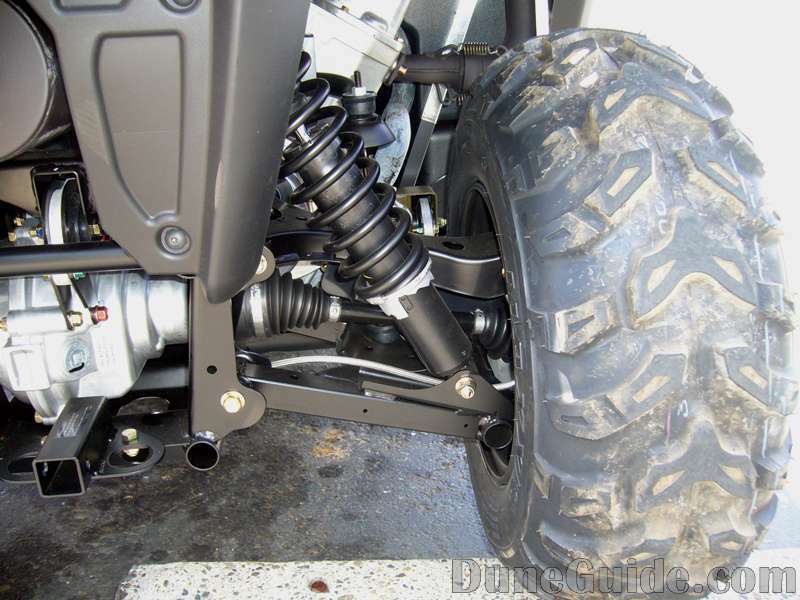 The RZR is 4 1/2 inches narrower than the Rhino. 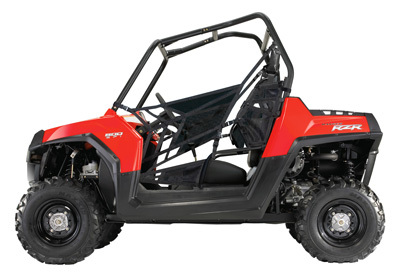 The RZR is smaller than the Rhino in every dimension except wheelbase. 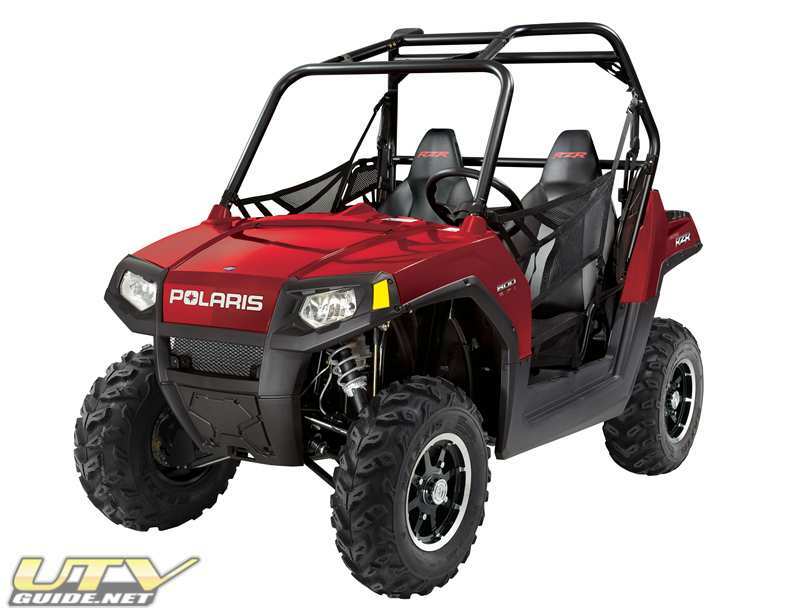 Polaris Ranger RZR is 50" wide so it can fit on ATV trails. Another nice part about the length of the RZR at 102 inches is you can load it sideways on a trailer and still be legal on the road. The Rhino and Prowler are too long to sit sideways and still be within the maximum width of 102 inches. 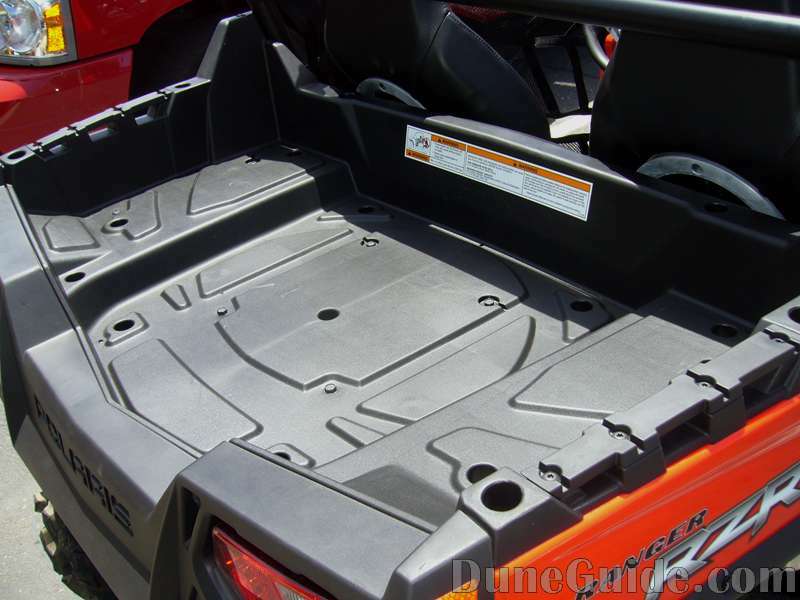 The RZR will also fit in the back of a truck much easier than a Rhino. 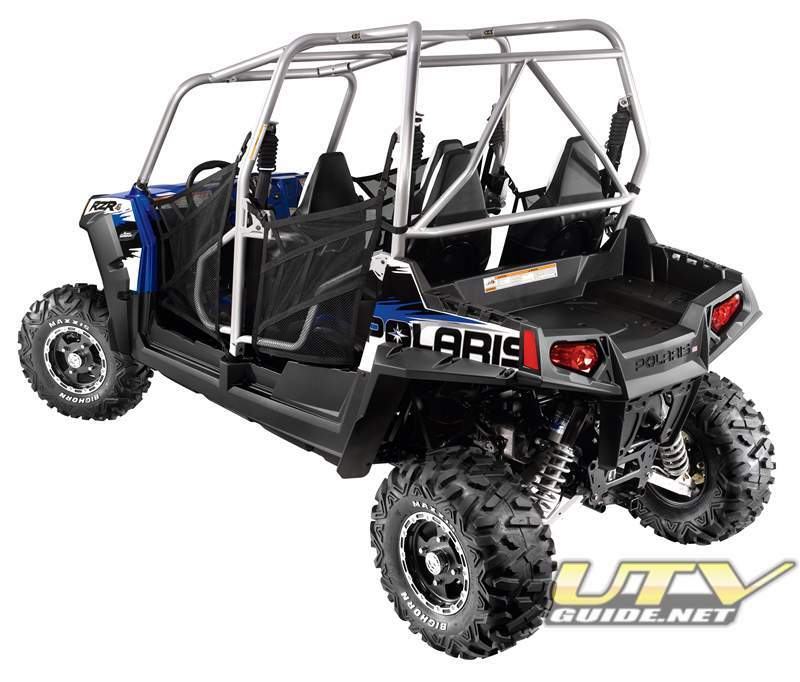 With the traversally mounted engine placed behind the seats, Polaris was able to lower the seats by at least 7 inches to that the Rhino & Arctic Cat. The lower center of gravity will help stability and responsiveness. 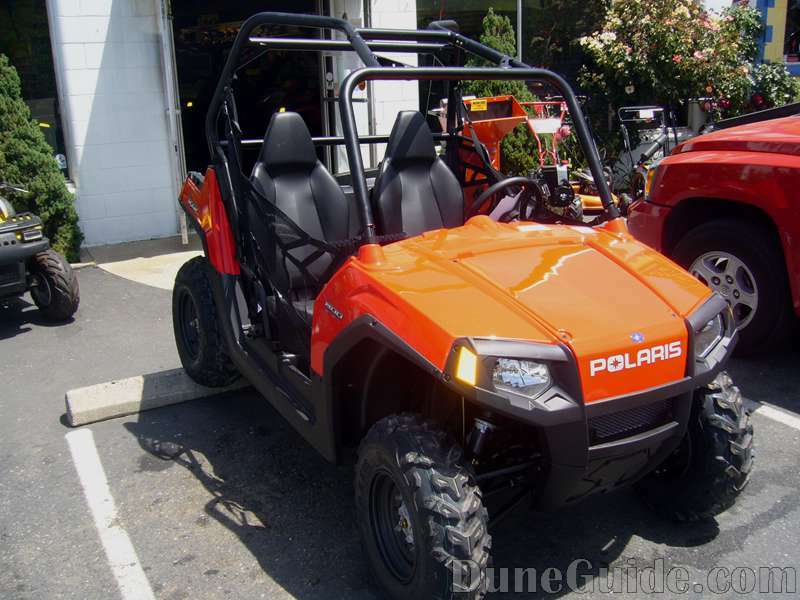 Polaris thinks this is such an advantage they have a patent pending. 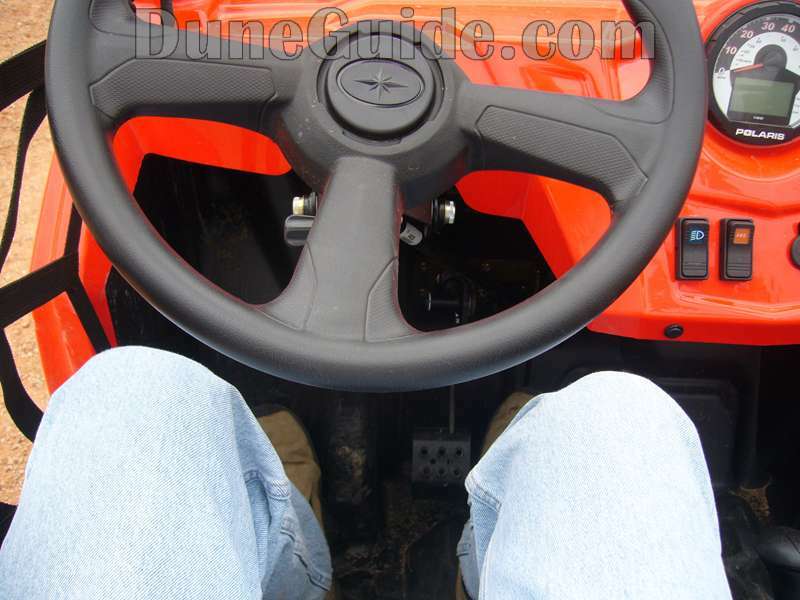 Seat position helps lower center of gravity. Weight bias is about 45 percent to the front and 55 percent to the rear. 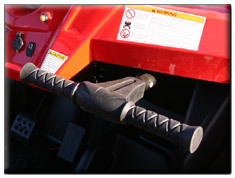 The Rhino sports 7.3” travel front and rear. 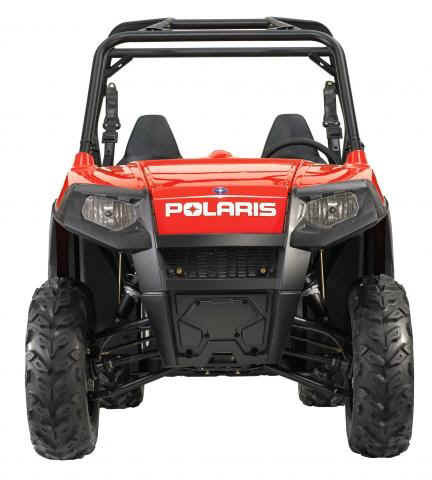 The Polaris RZR has 9" of front wheel travel & 9.5" of rear wheel travel. has 9.5" of wheel travel. 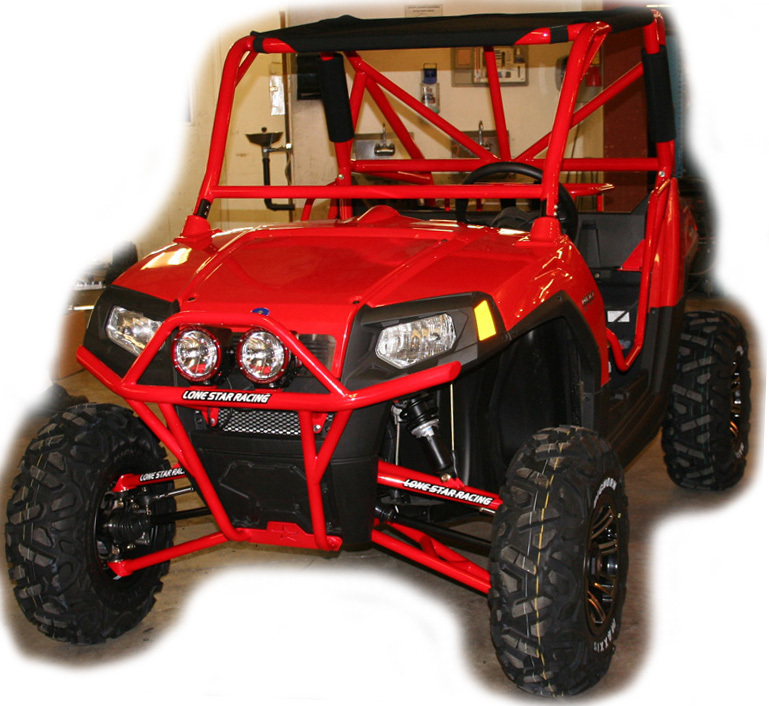 The RZR is also the only side-by-side that is available with a front anti-sway bar. 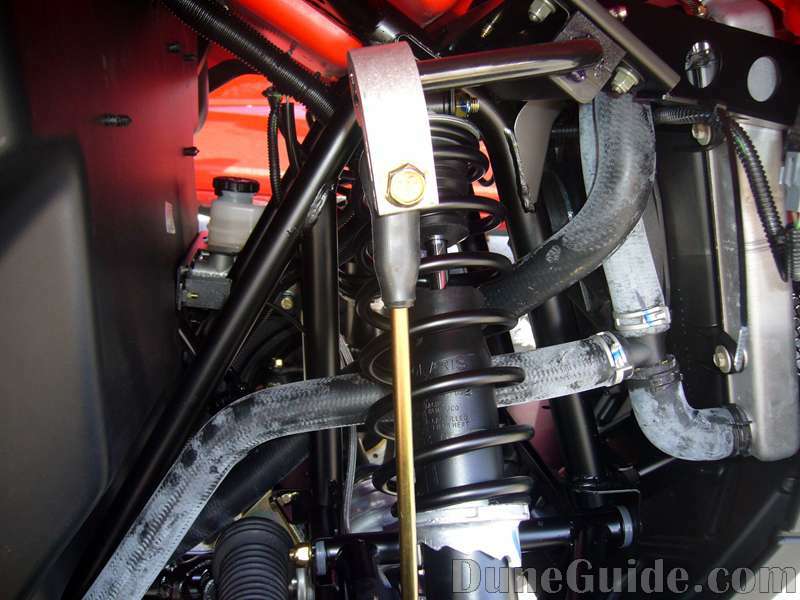 Front and rear anti-sway bars make the RZR more stable in hard cornering. 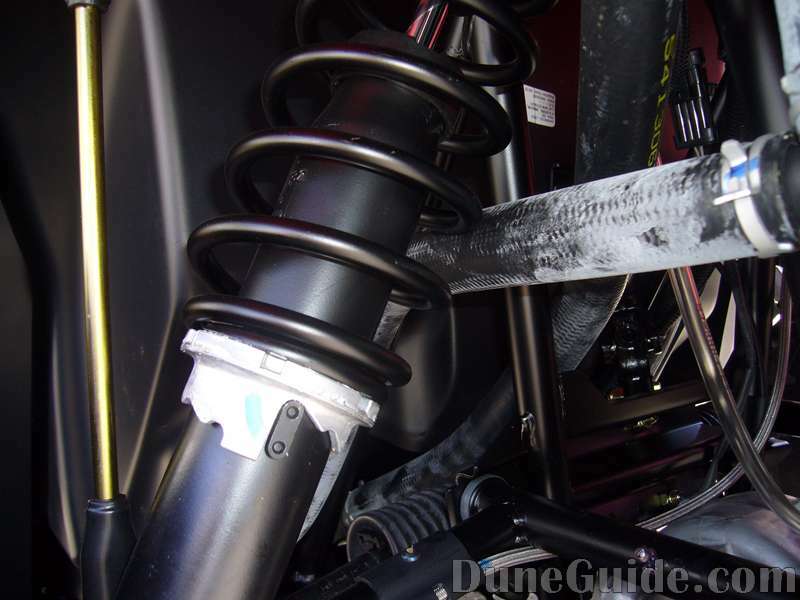 We need to take a look at how easy it is to disable the anti-sway bar for rock crawling type use where the bars limit off-camber wheel travel. The front sway bar is pretty weak in the dunes. If you want to jump at all, I would recommend removing the front sway bar. 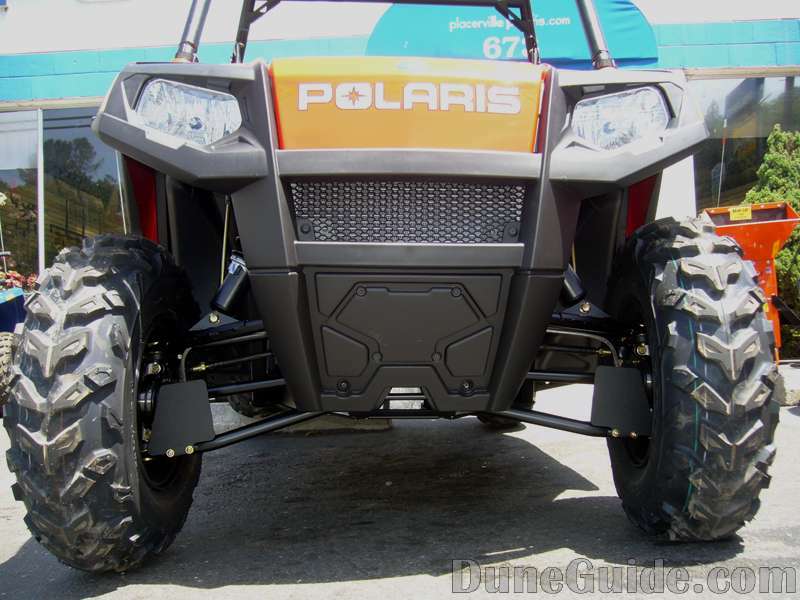 Polaris equipped the RZR with an all-wheel drive (AWD) traction system. 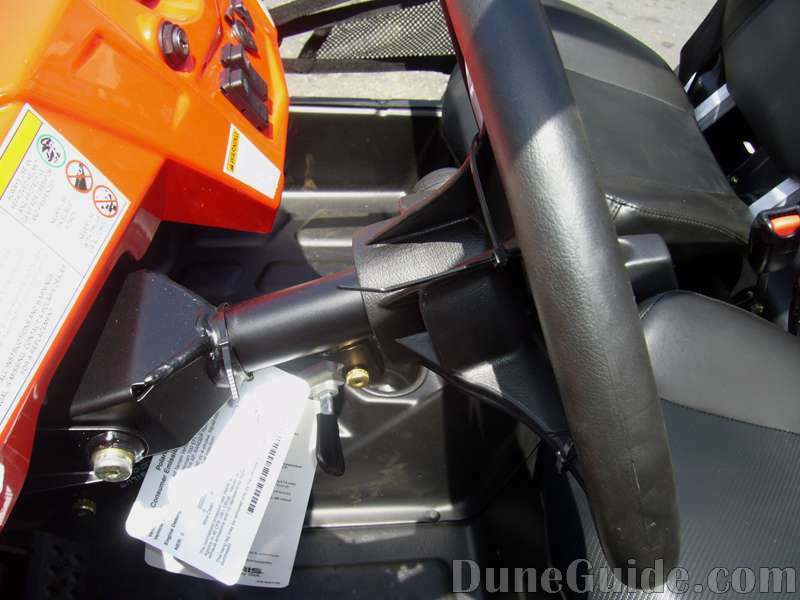 The AWD is enabled or disabled via a dash-mounted switch. 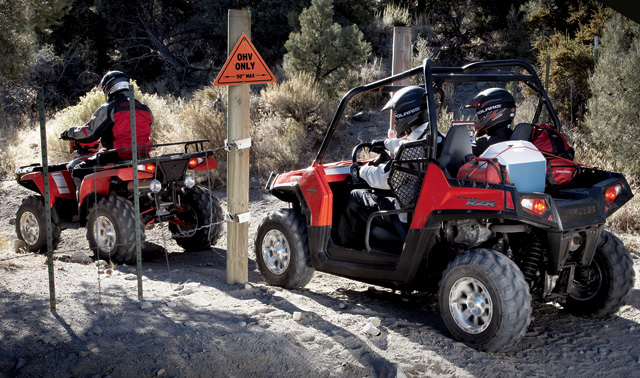 When enabled, the RZR senses wheel slippage and automatically engages the AWD. Then when traction is no longer needed, the system automatically reverts back to 2WD. In the dunes, I find it is more fun to run in 2 wheel drive. 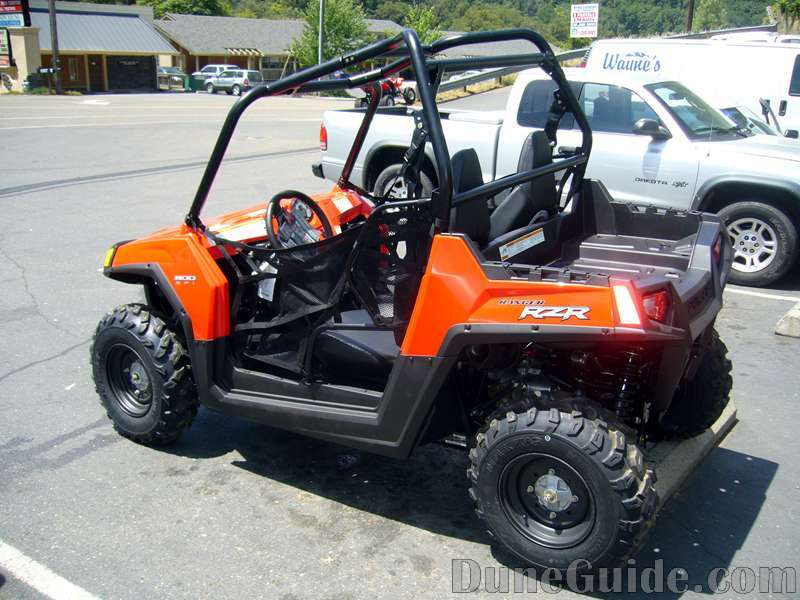 But I did find that the RZR would climb steep hills farther in AWD. And it looks like Polaris did their homework and learned from Yamaha's mistake. 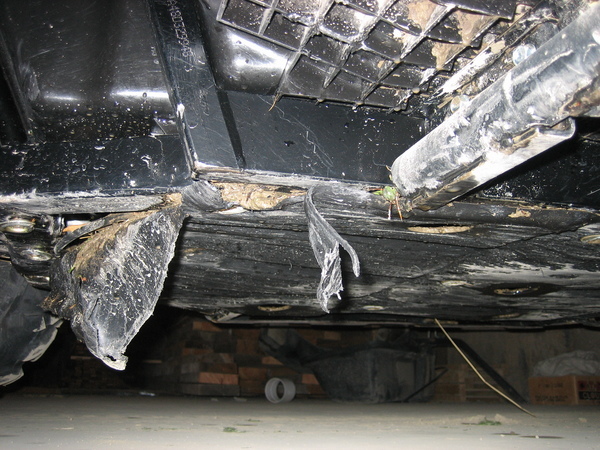 They include nets and deep foot wells to keep your legs in the vehicle during a roll-over. 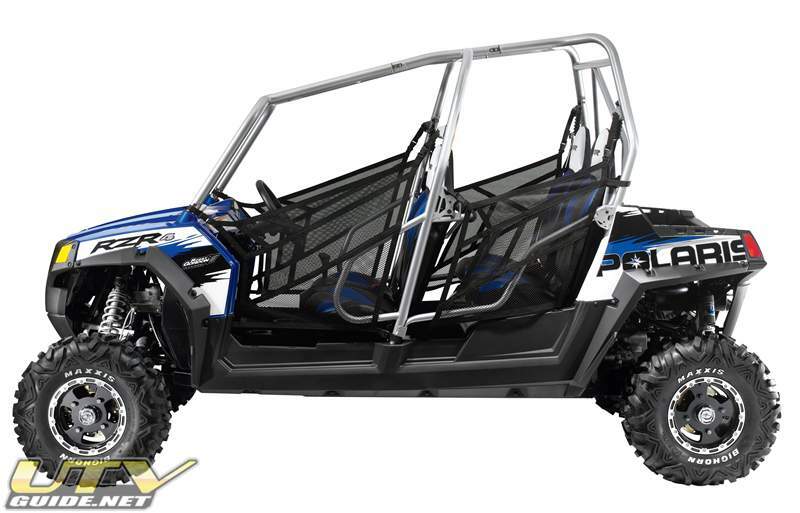 The RZR comes with nets to keep legs inside the UTV. This is a pre-production version. This is the production version. The leg nets are there, plus another net that overlaps and goes higher. Not overly user-friendly. 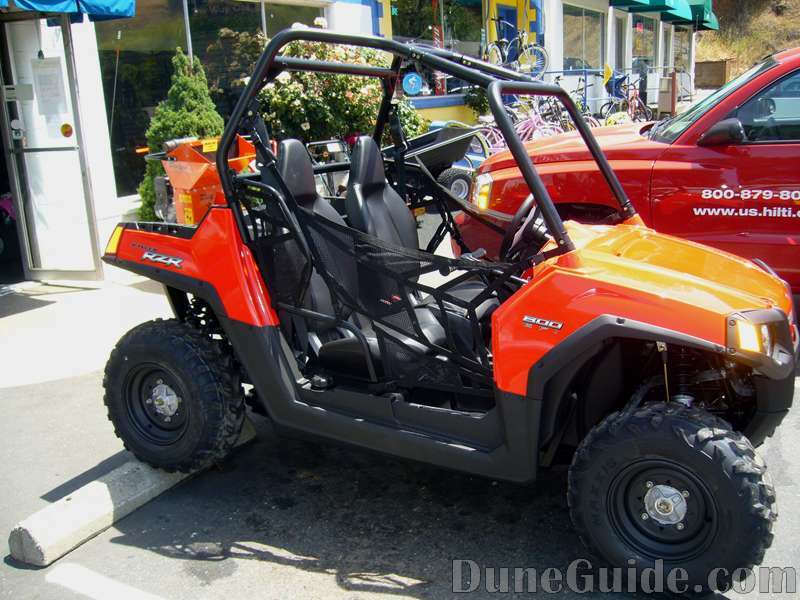 And doesn't help with the RZR's overall appearance either. Since the engine sits sideways, the exhaust exits right near the passenger fender. Not the greatest location. Aftermarket exhaust manufacturers will have to make a similar bend, so don't expect this to be fixed with a new pipe. And the exhaust "heat shield" will touch your plastic and melt it. 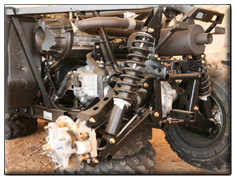 This problem is fixed with the 2011 Polaris RZR. 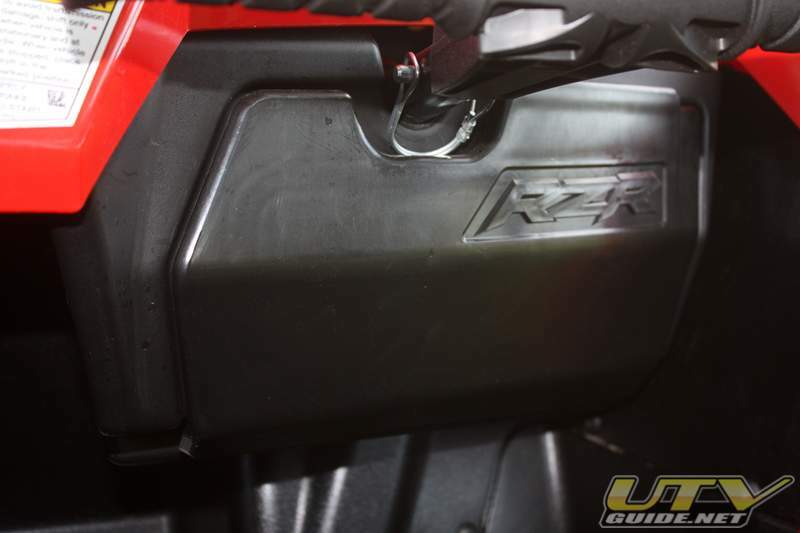 All RZR models now use the RZR S headers and there is heat shielding on the plastic. The radiator hose routing seems a bit sketchy. This hose runs right next to the passenger side front shock. It can easily touch the coil spring. 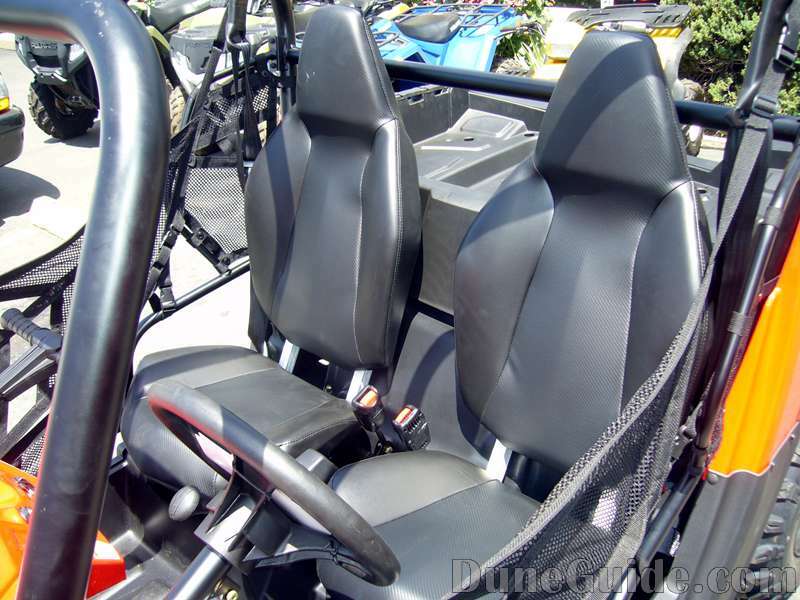 The RZR seats are much improved over Yamaha Rhino, but are a bit stiff. They are pretty thin so aftermarket seats will be tough to fit without losing leg room. The Seat belts can be a bit sensitive when trying to retract the belt on un-level ground. Moving to level ground seems to help. Best solution is to swap to an aftermarket four-point harness. There have been problems with the air filter letting debris into the engine. New aftermarket air filter setups will help cure this, but hopefully Polaris will come out with a fix for this problem. There is a TSB on all units made before August 2007. 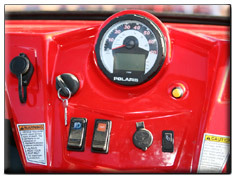 Check with your local Polaris dealer to see if the TSB applies to your RZR. Newer units have had some adjustments to help seal the intake. Tilt steering from the factory is a nice addition, but the wheel does feel a bit flimsy. The factory "roll" cage definitely has a case of the uglies. The roll cage material sounded real thin when you tap on it with your fingernail. 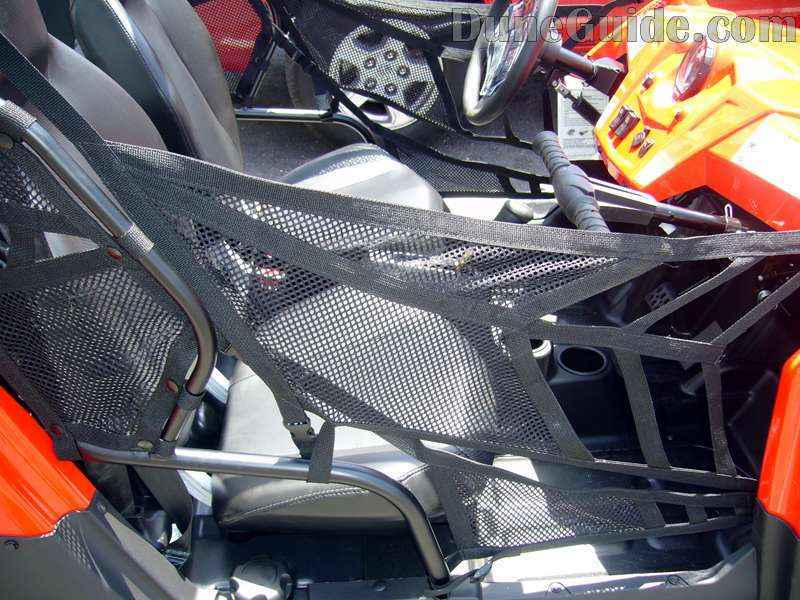 I would quickly invest in an aftermarket cage to increase safety and appearance. I am 6' 1" and the RZR it was a bit tight for me. I would be more comfortable with a bit more space. 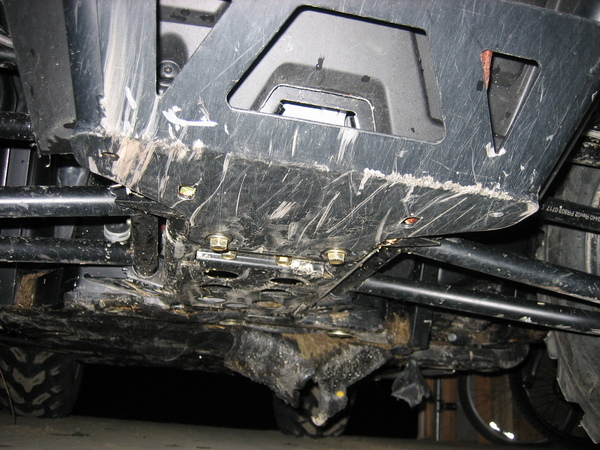 The bed on the RZR is very small, but setup to use Polaris lock and load type tie downs. 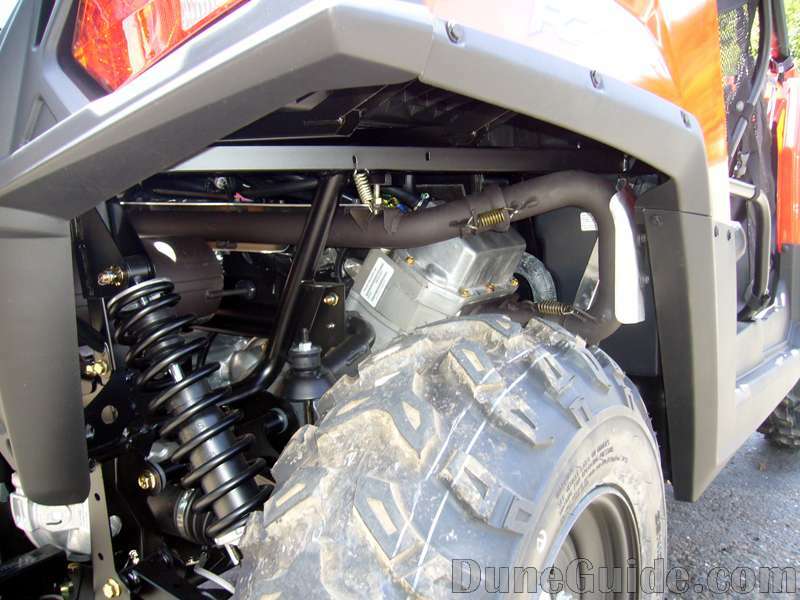 Ground clearance of the RZR is advertised at 10" vs. 12" for the Rhino. In reality, it is lower than 10" and hangs up on lots of trail obstacles. Also a bit low in the dunes when crossing ridges. 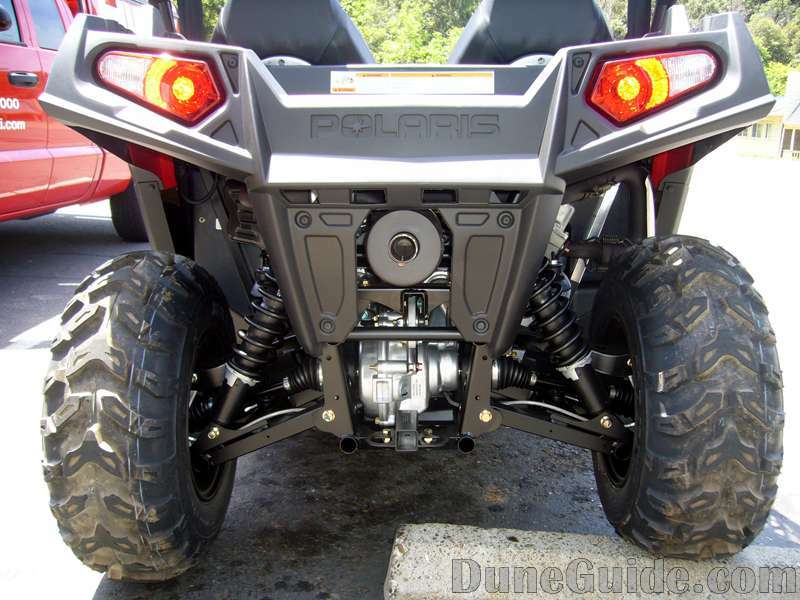 I think that the low ground clearance is probably the biggest negative to the Polaris RZR. 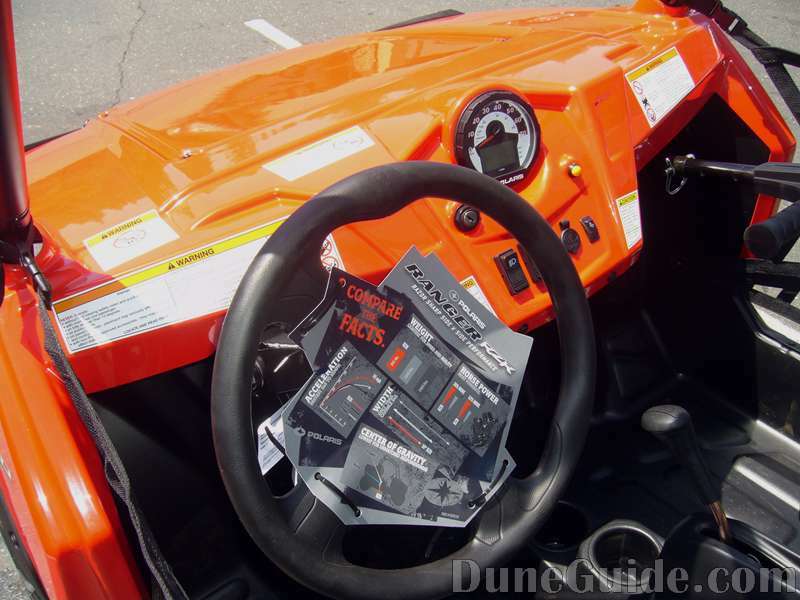 The RZR does not have a separate emergency brake or parking brake. The gear selector has a "Park" selection which puts the transmission in Park. A separate e-brake would be nice to have. 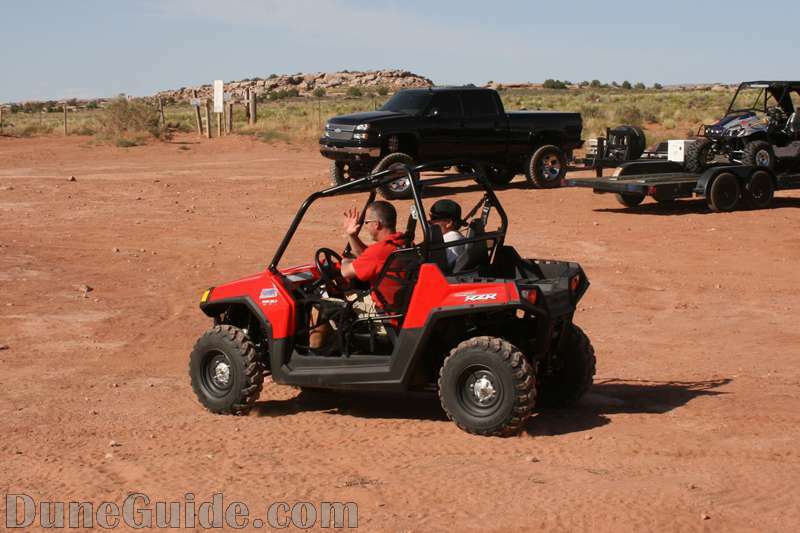 The RZR has a Hitch Towing Capacity or 1500 lbs, but don't expect to tow that much. The receiver cannot handle any tongue weight. I towed a wood splitter (very little tongue weight) a short distance and bent the receiver mount. 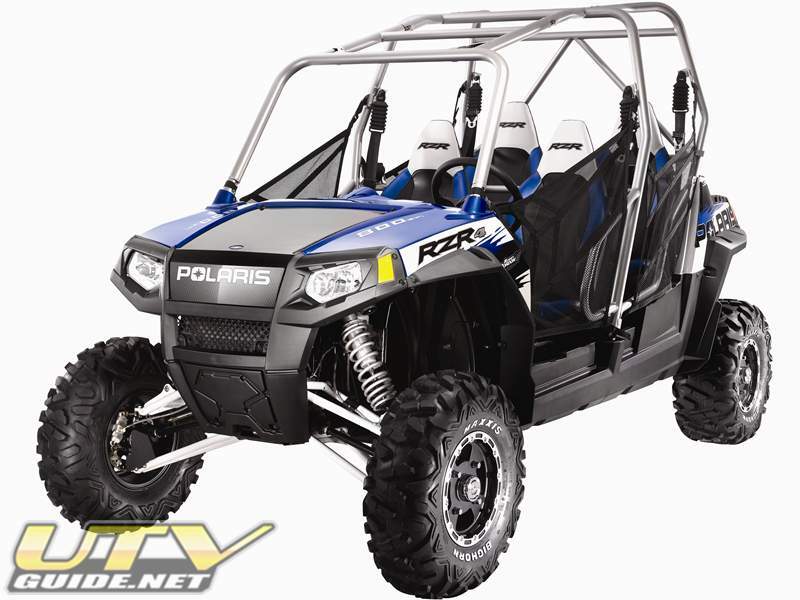 The RZR roll cage does not have any provision for a whip flag. 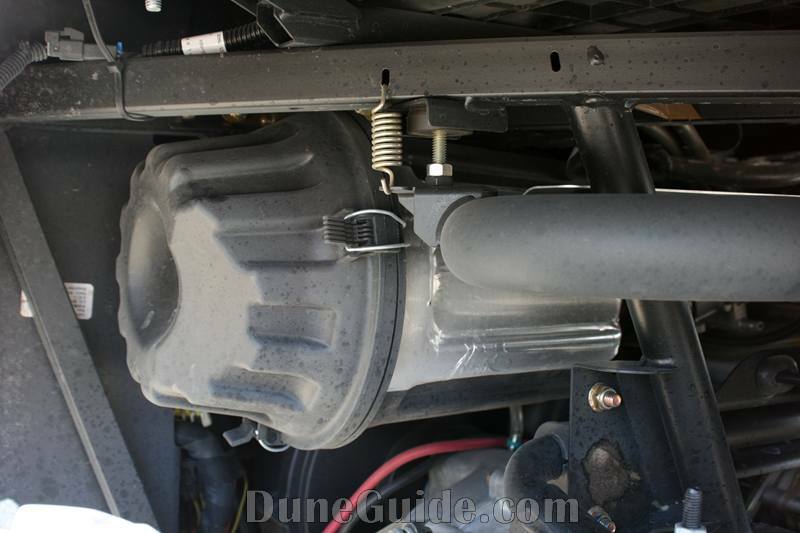 Plan to add a whip flag mount if you are headed to the dunes. The RZR does not come with a rear-view mirror. Available colors are green and red. 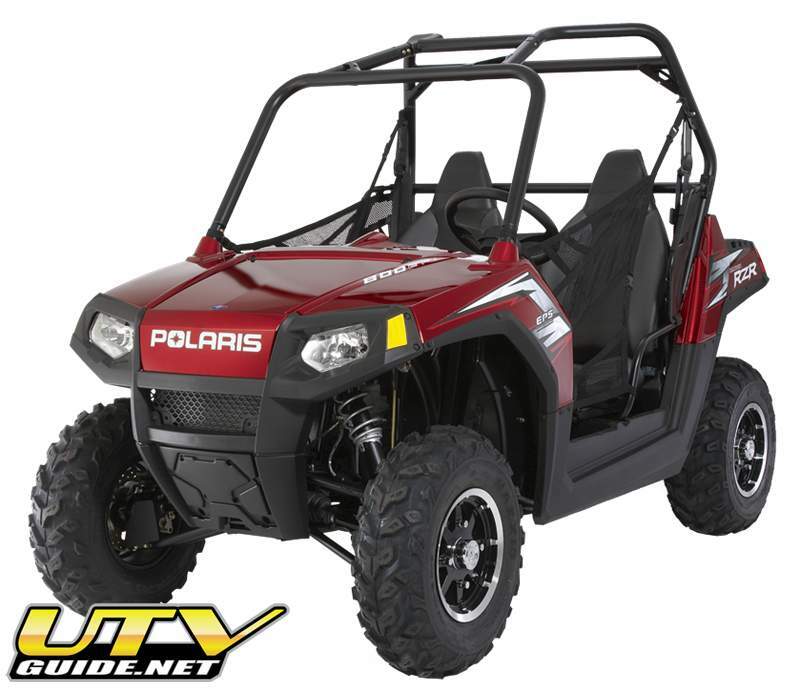 The Polaris RZR is now available at Polaris dealerships, with an MSRP of $10,299. 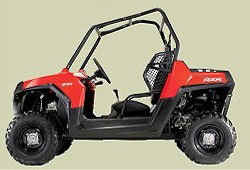 Minneapolis, January 21, 2010 – Polaris Industries today announced the company’s new limited edition ATV and Side-by-Side offerings. 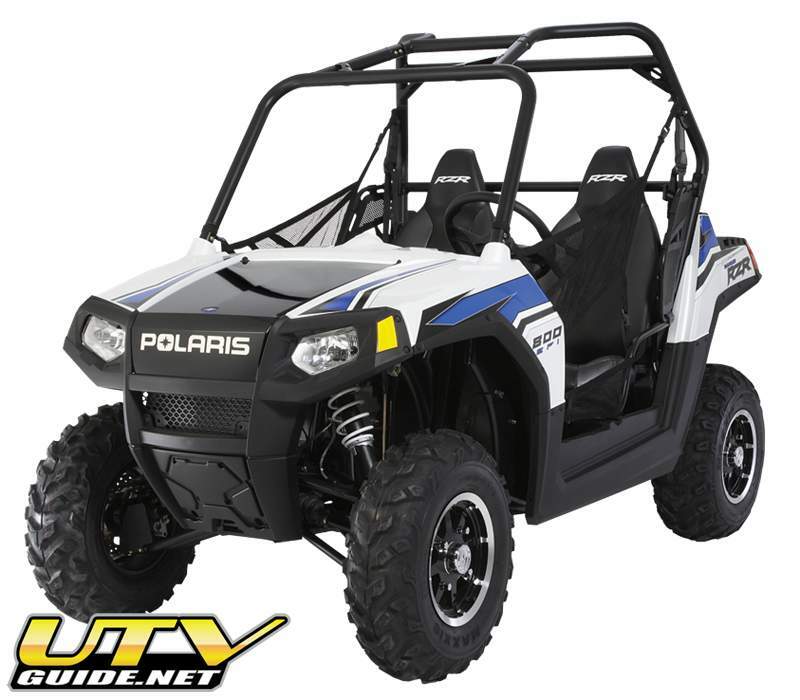 In the past, Polaris’ limited editions have been cosmetic upgrades such as paint but this offering also includes units with performance and technology upgrades. 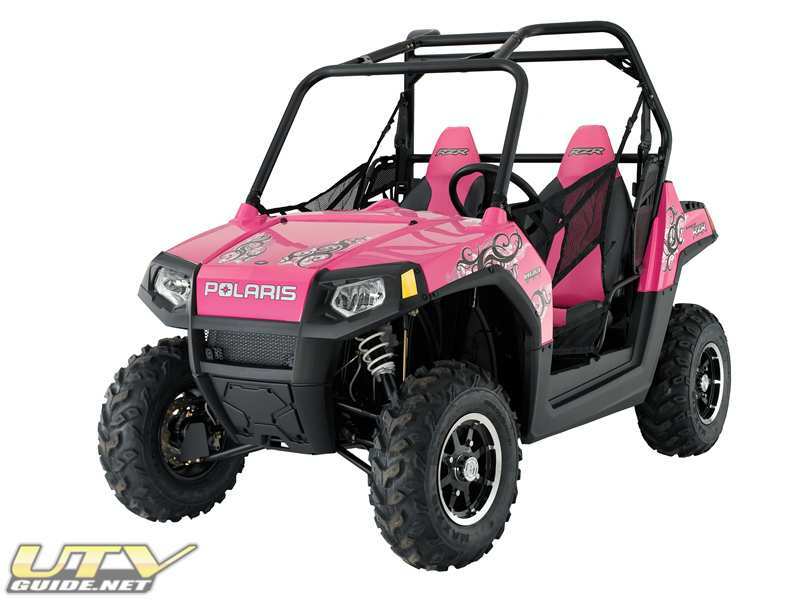 Included, is the first RANGER CREW and RANGER RZR with electronic power steering, and a 50-inch RANGER RZR with a premium Walker Evans shock package. 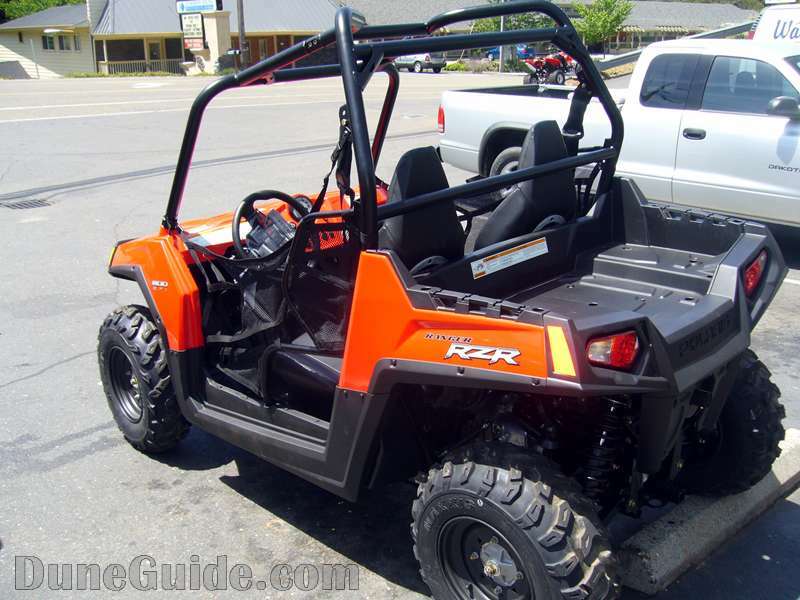 The RANGER RZR has the only family of Sport Side x Sides with Razor Sharp Performance for all types of recreation. 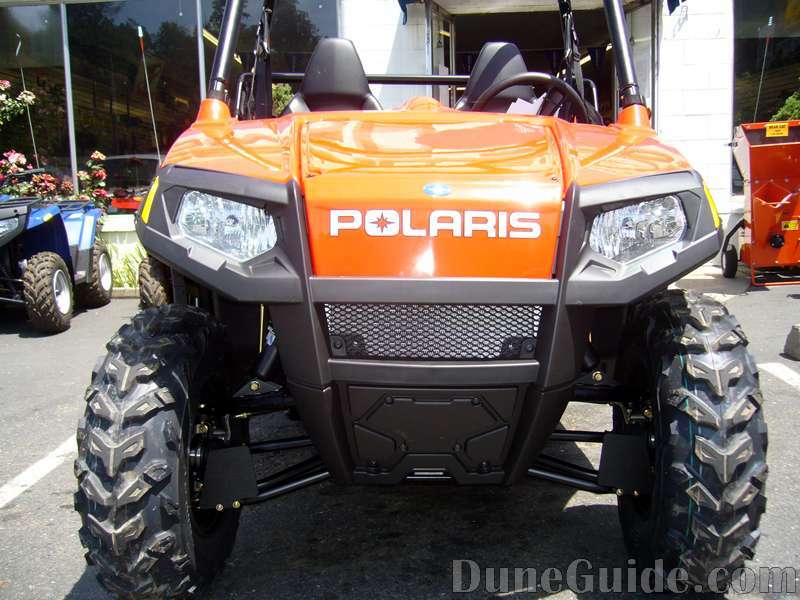 It all started in 2008 when Polaris introduced the only trail-capable Side x Side, the RANGER RZR 800. 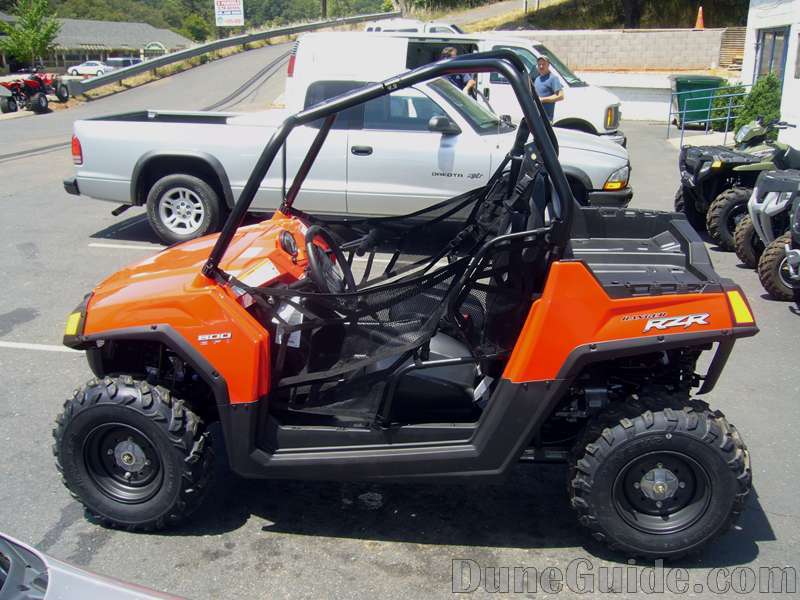 In 2009, came the only true-sport Side x Side, the RANGER RZR S 800. 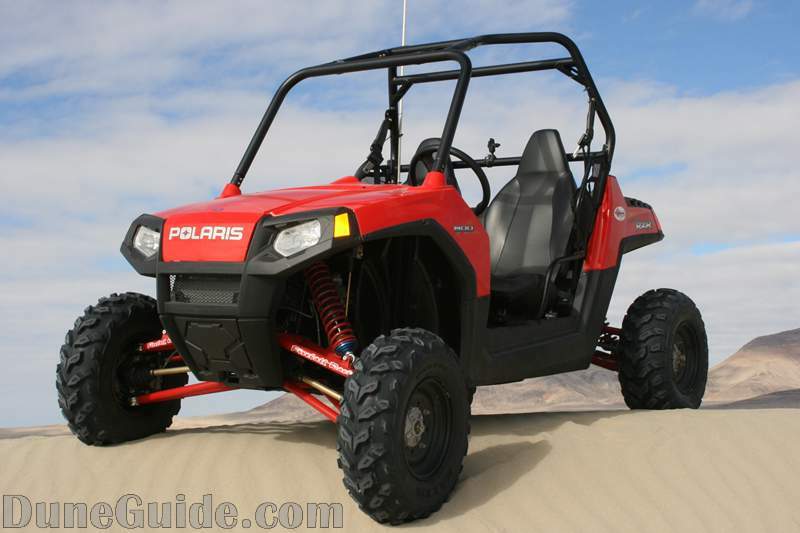 With the introduction of the RANGER RZR 4 800 in 2010, Polaris introduced the world’s only four-seat sport Side-by-Side. 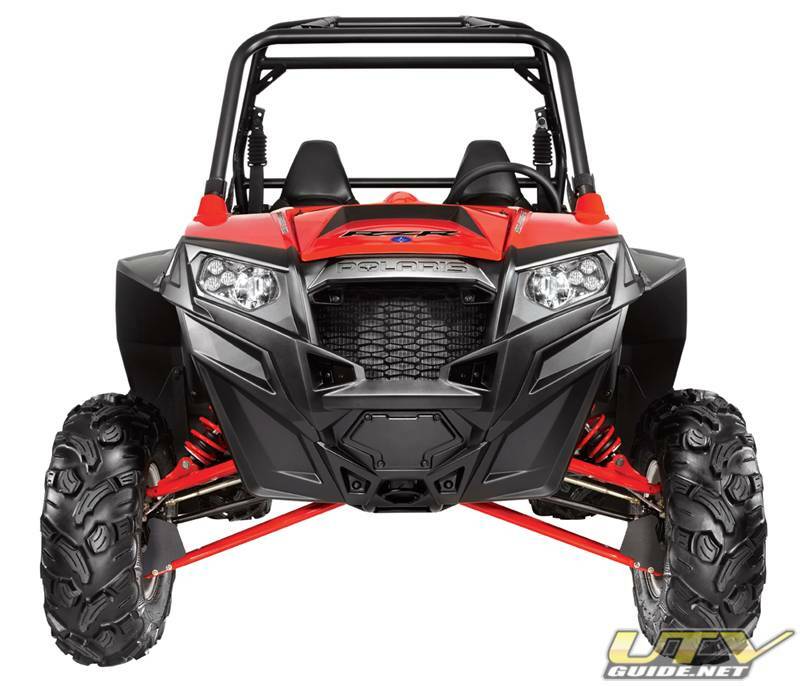 For 2011, the family adds the RANGER RZR XP 900, a whole new class of Side x Side that continues to offer the ultimate combination of power, suspension and agility and takes it to the extreme. 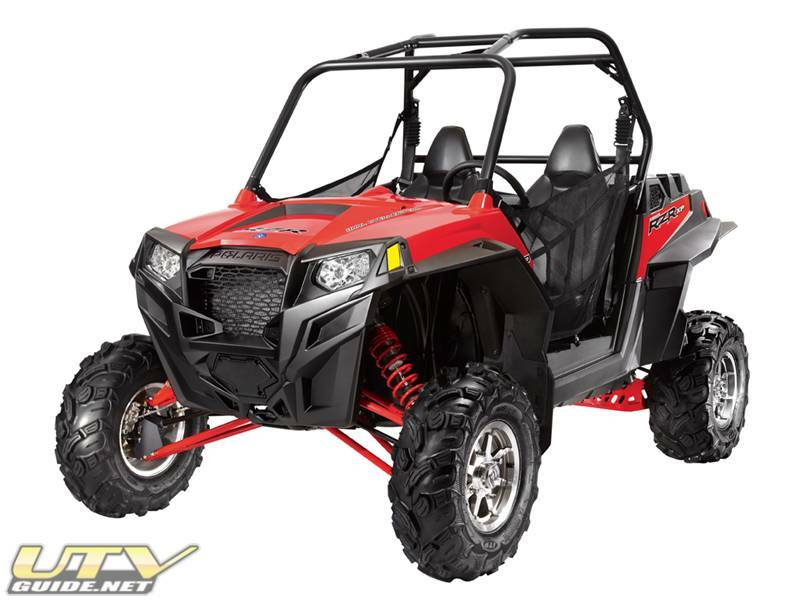 Built for razor-sharp, Xtreme performance, the RANGER RZR XP 900 has a new 88 horsepower, 900 Twin, Electronic Fuel Injected (EFI) engine, a new 3-Link Trailing Arm Independent Rear Suspension (IRS) with 13-inches of ground clearance and 14-inches of travel, and is light weight with a low center of gravity for unmatched cornering. 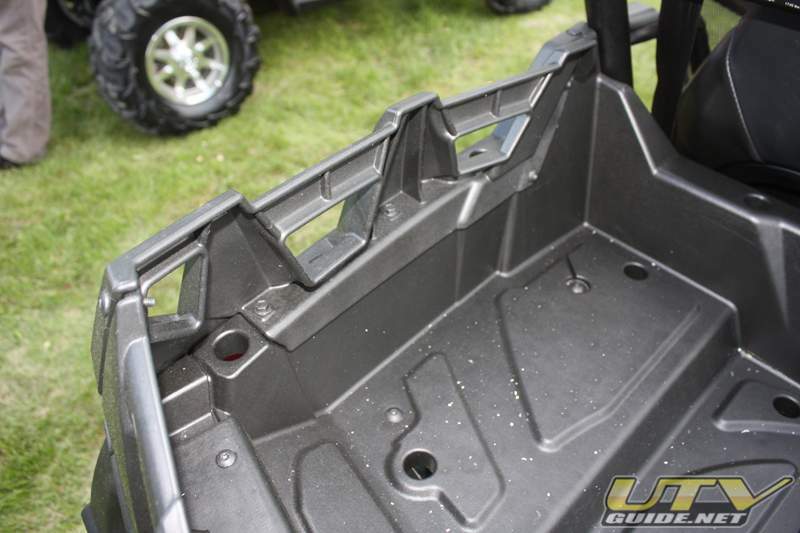 These features make the RANGER RZR XP 900 the only extreme performance Side x Side on the market.